This is a list of the best exercise games for the Xbox 360. Click here for the best fitness games for Xbox One. With the Xbox 360 stepping aside to make room for the Xbox One, this list is transforming from a running list of great fitness titles for the Xbox 360 to an “all time best” list. In time, I’ll be focusing new game reviews on the Xbox One, but I’ll keep this page up as reference. Here’s a tip: if you’ll be upgrading to an Xbox One, keep that in the living room with your big screen TV, and then take your old 360 and an old TV and use it to make a hi-tech fitness room in your house! On our blog, we try to provide an in-depth review for every Xbox fitness game we can get our hands on. But on this page, we’ll list out the “must-have” fitness and exercise games for the Xbox 360. Only the best of the best game titles will make it to this list. Nike+ Kinect Training is currently the exergame to beat on the Kinect. Great motion detection, truly personalized workout schedules, innovative user interfaces, excellent reporting, and optional integration with Nike+ accessories all come together to make this a solid workout title that’s the closest thing to having a real personal trainer in your Xbox. It’s not for everyone–you need at least 7-10 feet in front of the Kinect Sensor and from side to side in order to use the game–but as for right now it’s the one to beat. My next pick may come as a bit of a surprise. It’s Kung Fu High Impact . This is not an exercise game per se, but a fighting game that plays a lot like Street Fighter or Mortal Kombat. The difference is that YOU are the fighter. Not a cartoon representation of you or some klunky avatar, but your real-time video image interacting with the video game world. My philosophy has always been that video game exercise is only effective IF you actually do it. With this game, you’ll be having so much fun kicking and punching that you’ll hardly realize that you’re getting a great aerobic workout. Without exaggeration, this is easily the best video game workout I’ve gotten to date, as it’s one of the first games to really combine the fun of video games with natural movements. This is a very unique concept that works: take the addictive nature of rhythm games like Dance Dance Revolution and Guitar Hero, and apply it to basketball ball handling drills. The result is a hugely entertaining game that’s easy to learn, fun to play, and will actually build up real skills in the player that can be used on the basketball court. The game is not for everyone–if you live in an upstairs apartment I wouldn’t recommend the game unless your downstairs neighbor is very, very understanding. Having said that, this is a fantastic game especially for guys who feel a little self-conscious dancing to Dance Central or Just Dance choreography, but still want to play a cool rhythm game with their basketball buddies. Next on our list is Dance Central 3 . This the latest evolution to dance games like Just Dance on the Wii where you learn real dance moves instead of just stepping on the right spots or punching your fists in the right places in the air. The new Fitness Mode lets you dance, dance, dance the night away. It’ll track the calories you burn per session and the lifetime calories you’ve burned. As with the first version, Kinect tracking of your moves is spot-on, so while you’re sweating you’ll be learning some of the hottest dance moves which you can take to your next wedding or party! The routines are each under 5 minutes each, meaning you’ll need a good 6-7 routines to get a decent cardio workout–but there are enough songs on the disc (and more via DLC) that you won’t run out anytime soon. How much room you’ll need: 6-8 feet in front of the TV, 6-8 feet left and right. The third version of Zumba for the Xbox continues to bring more improvements over the first and second versions (Zumba Fitness and Zumba Fitness Rush), including improved tutorials, better motion controls, personal coaching by Zumba celebrities like Beto and Kass Martin, a much improved soundtrack, better graphics, great fitness features such as progress tracker and classes, and even some rudimentary online features that allow you to include your Xbox friends in your workouts. If you’re a Zumba fan, this is the version to get on any system. It’s the next best thing to being at an actual class. How much room you’ll need: Ideally, about 7-8 feet in front of the camera, and about 8-10 feet left to right. Coming in next is Your Shape Fitness Evolved 2012 , the update to the original launch title. It’s an evolutionary, not revolutionary, update to the previous version. It’s still decidedly less “fun” than other titles, as it’s more or less a traditional workout regimen of the type you’d find on an aerobics class or DVD. Having said that, it’s the best “pure exercise” game available for the Kinect. The technology is put to good use, as the system very accurately tells you how closely you’re following the correct motions. In addition, you can see for yourself by comparing your on-screen silhouette to your virtual trainer’s movements. How much room you’ll need: 6-8 feet in front of the TV, 8-10 feet left to right. miCoach by Adidas is a strong workout game with a little something for everyone. The main part of the game consists of strength and conditioning exercises appropriate for aspiring athletes, particularly those who play soccer, football, basketball, tennis, and track. “Classes” are held by real professional athletes in each sport, and workouts can run 60-90 minutes each. Another section of the game called “Conditioning” features workouts more intended for those of us who prefer workouts about 15-20 minutes in length. There’s also a section of the game called “Training Games” which include excellent first-person simulations of basketball shooting, soccer scoring, and tennis volleying all of which are excellent showcases of the “virtual reality” potential of the Kinect–not only are they excellent exercise games, they rival any Kinect game for innovation and responsiveness. Cardio work out: 3 of 5 (the game focuses on strength and conditioning and points you to MiCoach.Com for cardio exercises). How much room you’ll need: 7-9 feet in front of the camera, 7-10 feet left to right, 1 foot above, clear view of floor. Coming in next is the original Kinect Sports from Microsoft. Track & Field, Boxing, and Volleyball are all intense activities that’ll have your heart pounding whether you play against the computer or a friend. As you advance through the levels, it becomes harder and harder to beat, but because the games are so fun you won’t mind playing over and over again until you do. And during the process, of course, you’ll be getting better exercise than in the gym. If you intend to use this game for fitness purposes, the Calorie Challenge add-on is a must-have. The follow-up title, Kinect Sports Season Two , also provides a decent workout in the sport of Skiing, and does have some “running in place” in the sports of Baseball and Football, but for the most part I found the first version to be far superior both in terms of realism and immersive gameplay. Next on our list is Kinect Star Wars . While the thing everyone wanted to work–fighting with light sabers–doesn’t really work all that well, the rest of the game works great, from jumping to “using the force” with your hands to flying pod racers, speeder bikes, and spaceships with your whole body. The title also comes with mini-games that range from the ridiculous (a Dance Central clone) to the perfect “I gotta let some steam off” games (Rancor Rampage). How much room you’ll need: 8-10 feet in front of the TV, 8-10 feet left and right. Rounding out the top games are Just Dance 4 and Just Dance 3 . If you’re looking for precise “real dance moves” and intricate choreography, stick with Dance Central. On the other hand, if you’re looking for a hilarious party game that works with up to 4 players, as well as the ability to choreograph your own moves and challenge friends (or the world) to them, this is your best bet. The “Sweat” mode adds a great way to work out by letting you track “sweat points” (every 4.2 sweat points represents 1 calorie burned). How much room you’ll need: 6-8 feet in front of the TV, 6-8 feet left to right (8-10 feet for multiplayer). Kinect Rush: A Disney Pixar Adventure is another surprisingly strong movie tie-in game which seem to be a big hit amongst younger players, something rare for Kinect games where kids traditionally have seemed to have difficulty. You can explore multiple Pixar universes which are recreated quite well. Despite the diversity of the game environments the gameplay itself is kind of repetitive, but that’s not necessarily a bad thing if you’re playing with kids. How much room you’ll need: 8-10 feet in front of the TV, 8-10 feet left to right. 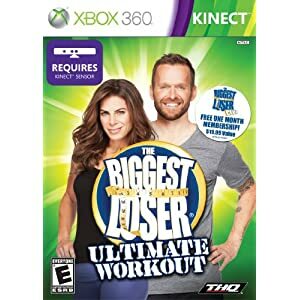 The Biggest Loser: Ultimate Workout is not the strongest workout game, but once THQ released free add-on content that let you play against actual contestants on the Biggest Loser TV show, my opinion of this game skyrocketed. Overall, not the most engaging of games fun-wise, but definitely the most intense workout routines available on any game. What on the surface sounds like a ridiculous idea–simulating the act of swimming while standing vertically outside of water–is executed surprisingly well. You feel the thrill of competition, and you end up getting a decent workout, working out muscle groups in the upper body that you actually use while swimming. While this won’t be a primary Xbox fitness game, it’s a great game to pull out when you get a little bored or tired of the others and need a break. Pair it with a set of hand weights to truly get the most exercise out of it (as well as prevent tendonitis from doing repetitive motions without resistance). Jillian Michaels Fitness Adventure is a great concept marred by spotty motion controls–when it works it’s great, but when it doesn’t it shuts down any enjoyment of the game. It has a comprehensive array of Jillian’s signature cardio moves, and a passably fun adventure mode where you make your way through a lush jungle by doing exercises. Not that you need a LOT of room for this one, so clear out all the furniture! How much room you’ll need: 10-12 feet in front of the TV, 10-12 feet left to right. UFC Personal Trainer is no watered-down exercise game–it starts you out with an intense fitness test, and then assigns you a level appropriate to your fitness level. Even at Beginner level, I was pushed to my maximum. What the game lacks in aesthetics or fanciness, it makes up for in sheer exhaustion and strenuousness. A good buy for fans of UFC, others can leave it. How much room you’ll need: 7-10 feet in front of the TV, 8-10 feet left to right. Agree with my rankings of the best Kinect Fitness Games? Think I’m way off on any of them? Know of any others that should be on the list? Share your comments here!